George, you and River City Catering added the final touch to our vow renewal event. Everyone loved the menu. I especially loved that everyone from the big guys to the kids enjoyed that food! Your dishes are top notch! You and your crew attended to every detail. Thank you for your suggestions, your ideas, and your professionalism. "Wonderful! [Our special employee dinner] was perfect and delivered exactly as described… The food was excellent (turkey moist / good flavor, salad was perfect, sides were well seasoned...) and received rave reviews from everyone, and as always I look forward to continuing to do business with you. You and your crew are the best!" "Thank you for the excellent dinner you prepared for us on Christmas Eve. Our meal provided by River City was unbelievable and everything tasted great. We had very little left after the family finished eating. Everyone raved about the food. Even the delivery person (Susan) was charming and extremely helpful. We will certainly use your business again and have passed the word to our family on who to call. Thanks again and have a great New Year!" "I just wanted to send you a note and thank you for the great service while we stayed at the Wingate. Everyone commented on how great the food was. We are thinking about the same location next year and will definitely be calling you back if that is what we decide to do. "Thank you very much. The food was excellent. Everything was beyond expectation. I am very pleased. Everyone at the party loved the food and the job Nate did. We have had many requests for your company info. Hopefully this leads to great business for you, it is well deserved. I will spread the word. Thank you very much." "We had our company Christmas party catered for the first time in 5 years. It was so wonderful to have someone do all the work including setting up the food. Our employees thoroughly enjoyed the food especially the toasted raviolis and chicken wings." "Thank you very much for lunch Friday. Everyone in the office raved about it all. You are great!" "Thank you so much for catering our Band Banquet. Everything was great!" "Hello George! I wanted to let you know the trays you made for our ribbon-cutting got rave reviews. Nearly all the people eating wanted to know where the food was from, and they took menus. Thanks again!" "Thank you for your catering services for our wedding reception. Your staff was extremely professional and helpful throughout the evening. The food was perfect and plentiful. I would highly recommend your catering service to anyone interested in considering you for their event." "Thank you for your professionalism in the planning, setting up and catering of our daughter's wedding." "We wanted to thank you for the wonderful food and service for our wedding. We have heard so many compliments about the food that night. We will be recommending your service to everyone!" "Thanks for all your help, George. You made the whole process painless." "We had to drop a note to say how excellent your food and staff were. Everything was set up on time and the hot food was hot. 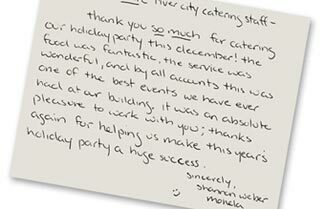 Partygoers raved on the quality of food and everyone wanted to know our caterer's name -- again." "Everything you brought to my Ram wives Christmas party made a huge hit and was loved by all. Not much leftover and not much waste, so it was perfect. You did a great job and I truly appreciate the hard work, time and effort put into the food. I'd recommend River City Catering to anyone." "Thank you for a great luncheon buffet. the food was great and service excellent. Some of the ladies enjoyed taking the leftovers home." "You can't beat their enthusiasm and professionalism when it comes to great food and service. George and his staff at River City consistently exceed our expectations, no matter how large or small the event. They really care." Rachel Kline, Grace Church in St. Louis, Mo. "Thanks so much for working with us for the FFH concert. The artists were pleased with everything. We look forward to working with you again in the future." "Wow! The food was truly fantastic! "We wanted to thank you for helping making our event a success. I am still hearing about how delicious the food was. Your staff that arrived was professional and pleasant. They did a great job serving! The selection of food and the quantity was perfect and our guys ate a lot. We even had some leftovers. We look forward to having you provide catering for our events in the future. "I just wanted to thank you for all your help in catering the meal for us. All the food was delicious and the person you sent to deliver was very nice. We look forward to working with you again in the future." "George.....on behalf of the entire Fellowship of Christian Athletes Golf Committee I would like to say thank you so much for your support and generosity. The BBQ was awesome as always and your kindness to the participants was noted by everyone I spoke with. Thanks again for exemplifying FCA's core values!" "Thank you so much for making our wedding reception awesome. The food was wonderful and the staff did a great job!" "The 70th anniversary breakfast at the Sts. Joachim and Anne Care Center was great! .....the food and Deanna's service was excellent! Deanna went to Sts. J & A for grade school and she remembered Jim & Ellen's faces from church. That simple gesture of remembering and going over to greet them speaks volumes to me of the impact my in-laws have had on others but it also speaks highly of your staff, George. If I remember correctly, there was some juice left and sausage patties but not much else - we had delicious food for 35 hungry people and they did not leave hungry! Again, George, thank you for your time in helping me to coordinate this event. It was a very special occasion and your advice and food/service helped make it so." "Thank you for the amazing food and set up for Amanda's wedding. You delivered exactly what was promised. We chose the right caterer!" "Everyone has just gone home after an awesome evening of GREAT FOOD AND FELLOWSHIP. We want to thank you so much for all your help with making this such a memorable evening." "Wow! It was absolutely stunning! What a great event we had for my daughter's wedding and reception. Your service was excellent, and I got so many compliments on the food. The favorite, by far, was the Chicken Cordon Bleu with the Cream Sauce. I know of two guests who went back for thirds! I am glad everyone felt so well-fed and happy." "Thank you so much for getting me through the summer. I really appreciate the good food and friendly service." "We use River City Catering and Banquets for a variety of needs at United Services. Meetings, special luncheons, and staff luncheons are just a few examples of the events we've asked River City to cater. We are usually on a very tight schedule, which is why we ask River City to help us out. They are prompt and deliver exactly what we ask for within our budget! I would recommend River City to anyone who needs a professional catering job. They won't be disappointed." Billy Collier, executive director of United Services in St. Charles, Mo. "River City Catering and Banquets has catered many wedding receptions at our facility, the Maryland Heights Centre. They are on our list of recommended caterers and we always get great reviews from our patrons who use them. They are detail-oriented, professional, and friendly. I like that!" Kathy Nix, rental facilitator of the Maryland Heights Centre in Maryland Heights, Mo. "Thanks a million! Everything was superb -- many compliments. We'll be back!" "Thank you for bringing the deliciosu food for the Barnes-Jewish Hospital Foundation luncheon. The food was exceptional and everyone wants me to call you again when we have our next office party." "We just want to say what a pleasure it was to work with you. The food was delicious, but most importantly you and all the people we dealt with were so pleasant and efficient." ©2018 River City Food, Inc. | Website redesign and updates by Spencer Web Design, Inc.